Note that our week is starting on Tuesday. You have seen the egg sandwiches, I’ll spare you the soup and banana (leftover soup out of the freezer–easiest lunch ever!). 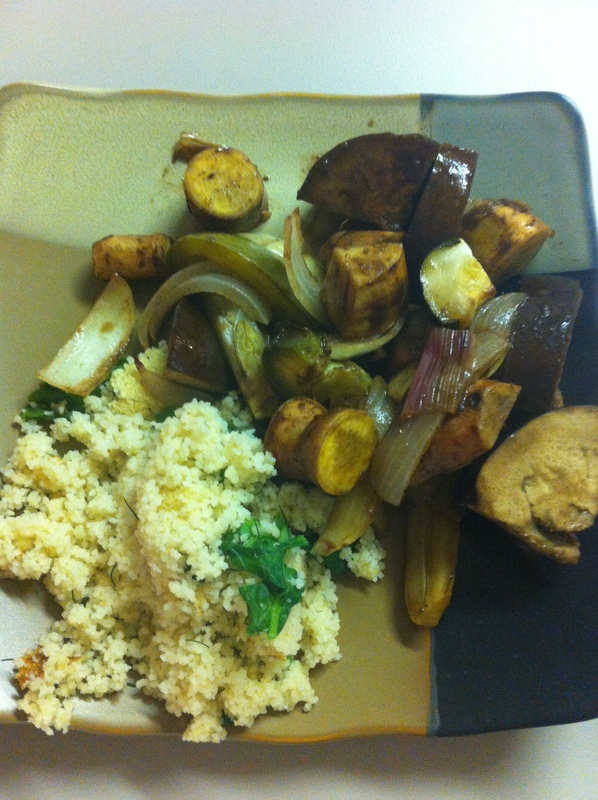 And now I’ll share with you what I meant by roasted veggies and couscous with greens. This is where the CSA plays a starring role. Fennel, red onions, sweet potatoes, eggplant, and green peppers all came from the CSA in the past 2 weeks, the zucchini was from the farmers’ market, and the white onions were from the grocery store. For the couscous, the mustard greens and fennel greens were both from the CSA over the past two weeks. Look how well they all did for themselves! I’m so proud. 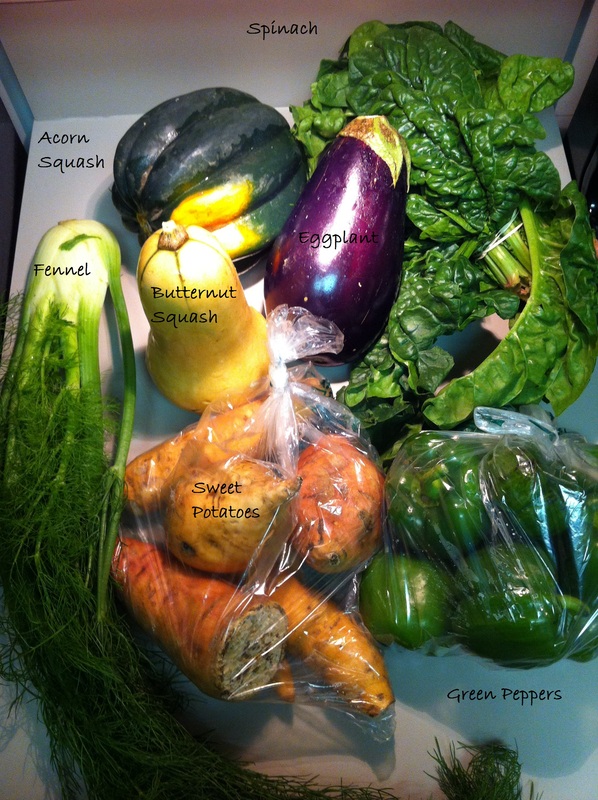 This week the CSA goodies worked very well together to create this single dish. Initially I just searched for a recipe for fennel since I had never cooked with it before. I found some interesting dishes that really starred fennel (like fennel and cucumber salsa), but I only had one bulb and I wasn’t going to get more fennel and then risk hating the entire dish of it! Instead I felt much more comfortable making a type of dish that I was familiar with (roasted vegetables) that happened to incorporate this new ingredient. I once read that piece of advice somewhere. When cooking with a new ingredient, don’t start with a new recipe. Incorporate it into a familiar recipe first. That makes logical sense, but what if a totally new recipe has inspired me to try a new ingredient? Or what if I can’t think of a way to incorporate a totally new ingredient? My first experiment with tofu was not a familiar recipe. Back to fennel. Turns out I love fennel. Not surprising since most folks compare it to black licorice, and I love black licorice. Once I told the husband that fact, he liked it less since he does not like black licorice (more for me!). I didn’t do this intentionally, but this natural experiment proves an important point–our expectations paint our experiences. Because he knew that others said it tasted like something he didn’t like (and because I knew it tasted like something I like), he didn’t like it as much (and I liked it more). I believe Dina Rose was the first to introduce me to this concept as it relates to tasting new foods in her blog about teaching kids to eat well. I can’t find the exact post, but I believer her instructions were to introduce a new food and compare it to a food they already like. So if the child already likes apples and they are about to eat a pear for the first time, you might tell her that pears taste a little bit like apples. Making roasted vegetables is pretty straight-forward. I did consult a recipe from Angela’s vegan blog Oh She Glows! which I follow (and drool over) daily and used her dressing. 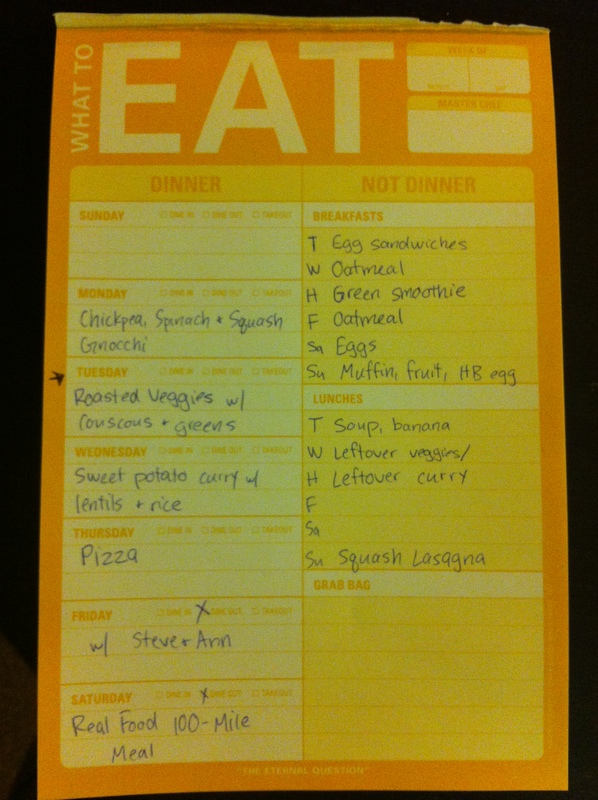 Here I just write out as a recipe what she described in writing. 2. Fill a roasting pan (I used a 9×13 glass dish) with cut up vegetables. Cut them according to how quickly they will cook. Hard tubers like carrots, potatoes, or squash will take a little longer and therefore should be a little smaller, while vegetables like zucchini, peppers, broccoli, or cauliflower can be left a little bit bigger. 3. Pour the dressing over the veggies and stir to coat all the veggies with some dressing love. 4. Bake for 35-45 minutes, depending on the size of your veggies. If you are still in the kitchen as they are cooking, give them a stir once or twice, too. I tend to wander off. If you are impatient like me, you will take them out after barely 30 minutes and tell yourself that the sweet potatoes and cooked enough (they were!) even though you know another 10 minutes and they would have been simply amazing. So do what I say and not what I do and be patient. To serve, I cooked up couscous according to package instructions with the the rest of our mustard greens thrown in. I added some fennel greens for flavor/garnish and served alongside a giant scoop of roasted veggies. Previous Post Previous post: Breakfast of Champions! Next Post Next post: I’m sweet on Vermont! I can’t think of a single veg that I don’t like better roasted!